Klik på billedet og se alle billeder fra Jolly Apart Sultan House. A terrace and a shared lounge are provided at Jolly Apart Sultan House, which is situated in Kas, 500 metres away from Kas Ataturk Statue and 500 metres away from Kas Bus Station. The Kas Lions Tomb and the Small Pebble Beach are within 800 metres and less than 1 km of the apartment, and free WiFi is provided. The apartment is equipped with 3 separate bedrooms and includes a kitchen with a dishwasher and a dining area. The apartment also offers 1 bathroom with a shower. 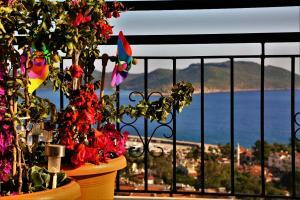 Kas Yacht Marina is a 12-minute walk from the apartment, while Hellenistic Theatre is 1.3 km away. A damage deposit of EUR 100 is required on arrival. This will be collected as a cash payment. You should be reimbursed on check-out. Payment before arrival via bank transfer is required. The property will contact you after you book to provide instructions. Please inform Jolly Apart Sultan House in advance of your expected arrival time. You can use the Special Requests box when booking, or contact the property directly with the contact details provided in your confirmation.